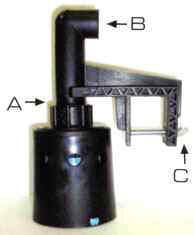 Maintains fluid levels using fluid pressure, as opposed to a lever arm and ball, as the force to close. Compact, self-contained design greatly enhances reliability. Body is made of durable glass-filled nylon 6/6; internal parts are made of ABS plastic, silicon and stainless steel. Meets anti-siphon requirements. 2 year guarantee. Replacement parts available. HUD03 - mounting bracket for 1"
HUD04 - mounting bracket for 1/2"